Poet Richard Hugo (1923-1982), has another birthday coming up. It’s December 21st. Born in White Center, Hugo was a poet and teacher whose books included White Center, The Triggering Town, Death of the Kapowsin Tavern, amongst other works. Seattle’s Hugo House is named for him. Celebrate his life and work and lift a pint on his birthday at Mac’s Triangle Pub in White Center. Here’s our coverage of last year’s celebration. 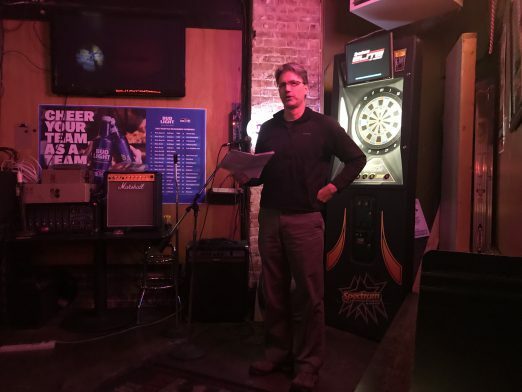 White Center resident Jeff Smoot read from his essay, “Finding Richard Hugo in White Center,” which will be published in an upcoming online literary magazine. Few writers have influenced Northwest literature as profoundly as poet Richard Hugo, who brought the region to life in his poetry and prose, including the White Center area where he was born and raised as well as rural Montana where he moved to become head of the University of Montana’s creative writing program. Other than Seattle’s Richard Hugo House, there hasn’t been much local celebration of his work, until now. The Writer’s Workshop will celebrate his career with a “Homage to Richard Hugo Night” on Thursday, Dec. 21 at 8 p.m. at Mac’s Triangle Pub (9454 Delridge Way SW), where Hugo used to hang out. 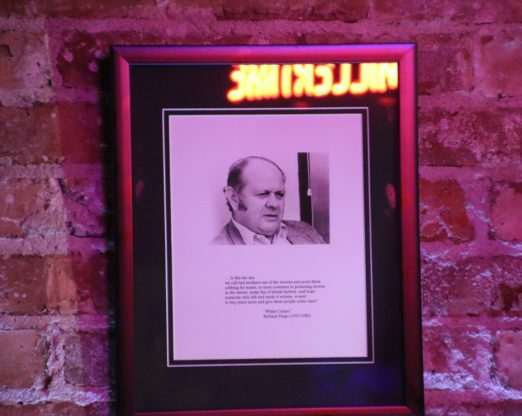 In addition to writing poetry and teaching, Hugo spent a lot of time in bars. The Triangle was one of them. The reading will include an unveiling of a framed Richard Hugo photo to be placed on the wall of the tavern, followed by readings at 8 p.m. by Nicholas O’Connell, founder of www.thewritersworkshop.net, from On Sacred Ground: The Spirit of Place in Pacific Northwest Literature; White Center resident Jeff Smoot reading from his essay, “Finding Richard Hugo in White Center,” forthcoming from the online literary magazine www.thewritersworkshopreview.net; and other poems/ stories about White Center and/or Richard Hugo. 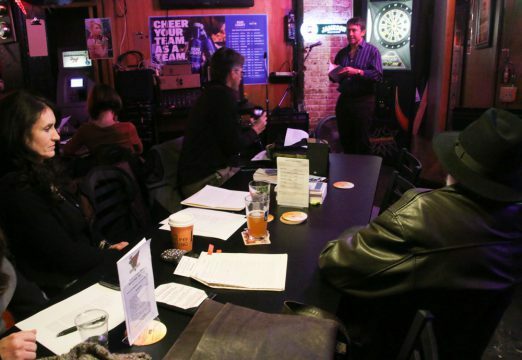 After 9 p.m., the event will continue in an open-mic format where people can read their poems/ stories (hopefully on Hugo-esque themes) on into the night. Hugo and other poets of the Northwest School sought to discover a place that resonated with them and allowed them to discover their own voice. Hugo referred to such a place as a “triggering subject,” a locale that fired a writer’s imagination. 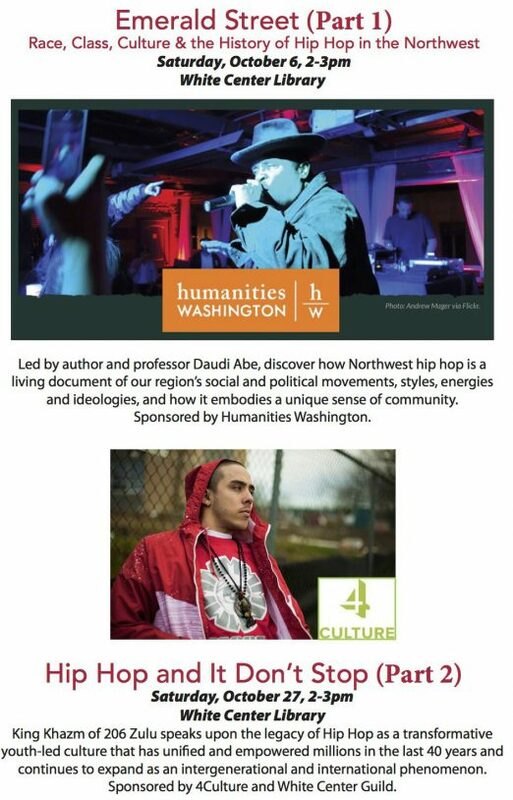 If you’d like to read at the event, please contact Nicholas O’Connell (nick@thewritersworkshop.net). The Writer’s Workshop is an online and on-campus The Writer’s Workshop is an online and on-campus Seattle writing workshop, specializing in fiction, nonfiction and travel writing classes. White Center-based Orchestra of Flight needs you! August 24th, 2016 Tracy Posted in Arts, White Center news Comments Off on White Center-based Orchestra of Flight needs you! The Orchestra of Flight, a community orchestra based in White Center, invites string players and percussionists to join us for our new season, beginning September 12, 2016. We rehearse Monday nights from 7:30 to 9:30 PM at Mt. View Presbyterian Church in White Center. No auditions are required. We are a noncompetitive, friendly organization. Our mission is to bring live orchestral music to communities whose members may have difficulty attending concerts in traditional venues. Come and have fun while improving your musical skills and sharing the gift of music with others. For more information, please visit our website, www.orchestraofflight.org, or contact us at info@orchestraofflight.org. The “visual stories” in this exhibit bear witness to the memories, struggles and dreams of refugees, asylees and immigrants of diverse ethnicities who now call White Center home. Their paintings illustrate that emotions conveyed and evoked by a single image can tell a story of a thousand words, build bridges of understanding and promote peaceful coexistence. Thanks to a generous grant from 4Culture; the leadership of White Center Community Development Association, King County Library System and Network for Integrating New Americans; and the support of our visual storytelling workshop hosts at South Seattle College, New Futures Arbor Heights, King County Housing Authority Seola Gardens, Cascade Middle School and Highline College, we were able to offer a series of eight workshops to representatives of White Center’s foreign-born communities. Initially, workshop participants questioned why anyone would care about their stories. Yet the more they reflected on the often daunting challenges they had overcome, the more their self-confidence grew. Soon, they began to believe in the power of their (visual) voices. Their stories did matter. In fact, they could help those who would follow in their footsteps as well as those who continue to face human rights abuses and/or extreme poverty in their native lands. This exhibit offers never-before-seen glimpses into the life-stories of White Center’s refugees and immigrants. Drawn into their inner worlds, we receive clues to what it’s like to leave—or be forced to flee—one’s native land and rebuild one’s life in a foreign country. After reflecting on the paintings and accompanying captions, you too will be moved to honor the courage, resilience and irrepressible hope of those who contributed, often bravely. At the end of the exhibit you will find a brief feedback form. We would be grateful if you could share your reactions and offer any words of encouragement for the workshop participants. 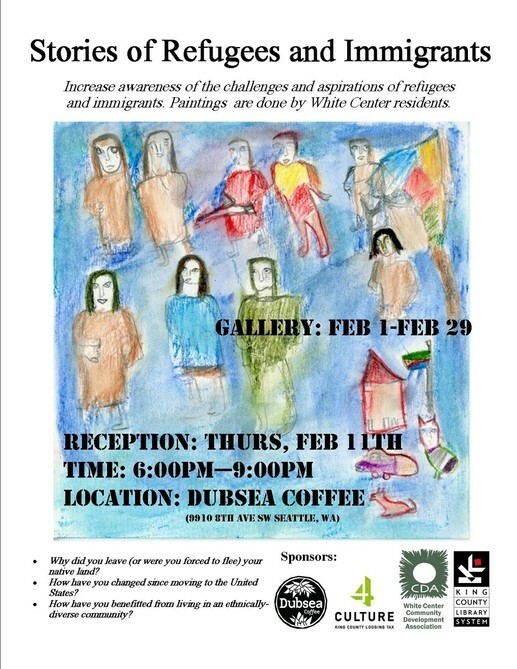 Finally, we would like to thank Dubsea Coffee for hosting this exhibit through the end of February. Please join us 6:00-9:00 pm, Friday, February 11, for the reception, an opportunity to learn more about the workshops and hear from some of the participants. If you didn’t get to the tribute to poet Richard Hugo last night at the White Center Fieldhouse and haven’t otherwise had the chance to see the biographical documentary shown during it, “Kicking the Loose Gravel Home,” you might want to watch at least part of it online. 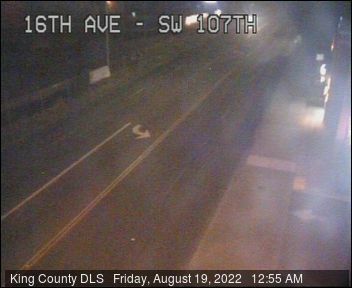 The folks at Caffé Delia shared the link this morning and pointed out that starting around 12 minutes in – and continuing off and on for at least 10 minutes after that – you’ll see ample footage of White Center in the mid-’70s (and South Delridge, too). The film is from 1976. Just grab and pull the “play” bar in the window above. The film, by the way, is by author/filmmaker Annick Smith, from Montana, where Hugo wound up, miles and years from his beginnings here. Happening tonight – and it’s free! The Southwest Seattle Historical Society is presenting a concert and film, “Some Places Are Forever Afternoon: A Tribute in Music, Words, and Film to White Center’s Richard Hugo,” starting at 6 pm inside the historic White Center Fieldhouse at Steve Cox Memorial Park (1321 SW 102nd). 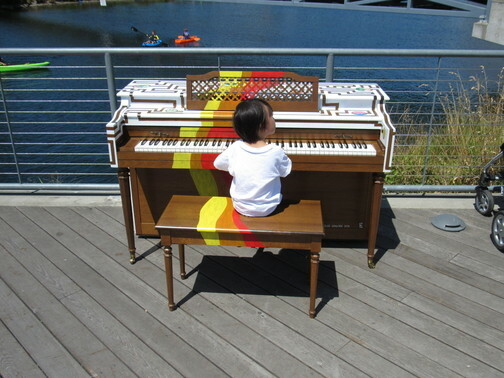 Everyone gets in at no charge thanks to funding by 4Culture; the concert features pianist/composer Wayne Horvitz (who’s in the video invitation above), who released a Hugo-tribute CD in July. The event also will show “Kicking the Loose Gravel Home,” an hour-long 1976 film about Hugo, who was just 58 when he died in 1982. Everyone’s welcome! I just opened a new eclectic, local, art boutique in White Center. It is located directly across the street from Proletariat Pizza and is called Star Palace. I opened the store with hopes to give all of the amazing artists and designers in Seattle a place to showcase their work. see some local south side faces. Star Palace is at 9617 16th SW, right next to Herban Legends. May 21st, 2014 Tracy Posted in Arts, How to Help, White Center news Comments Off on Music is the universal language: Help White Center Heights Elementary students speak it – with ukuleles! That video is part of a brand-new crowdfunding campaign in hopes of raising money to get ukuleles for students at White Center Heights Elementary School – watch it to get their thanks in advance, and then go here to contribute. As previewed here last night, “Winter Fire” reigned in the reign right after nightfall at Greenbridge Plaza, about seven hours after winter’s official arrival (9:11 our time this morning). P.S. In nearby Highland Park, a fire performance is also usually part of the “Not So Silent Night” New Year’s Eve parade, which starts from and finishes at HP Improvement Club headquarters – 6:30 pm December 31st. Burien filmmaker Jeff Ferrell‘s latest project has just come to fruition. “Ghostlight,” a horror film set in a historic theater, is the collaborative effort of local area actors, sound directors, and supervisors, including collaborators from White Center and West Seattle. Filming has been in progress since 2012, and the premiere run is under way. The Historic Everett Theatre, where the movie was filmed, is the oldest active theater west of the Rocky Mountains. The theater has served as an opera house, vaudeville theater, stop-motion cinema and arts venue. In 1923, a fire devastated the interior and caused a partial collapse to the front wall. It was rebuilt in 1924, and reopened with 1,200 seats. When you step inside, the high walls slope to meet with a dome ceiling, interrupted by balconies whose railings flush with engravings. The street of the town where the theater is located gives no acknowledgment of such a past. The theater is nestled between an Irish sports bar and a bank. Ferrell first encountered the Everett Theatre while working on a 1920’s-styled music video with his friend David Stedman. When Ferrell learned the theater was said to be haunted, he asked to spend the night there alone. He packed a bag, a camera, and a guitar. “I brought my guitar to play songs on stage for the ghosts,” says Ferrell, his wry-black eyes undulating with amusement. Ferrell’s movie “Ghostlight” was filmed along similar premises to his actual experience that night in the Everett Theatre: main character, Andrew, spends the night alone in an allegedly haunted theater, in order to receive a large sum of money. Ferrell says that while the movie is fictional, there are many internal reflections of real events: some which occurred during his own stay within the historic walls, and some which occurred during the filming itself. Once during production, Ferrell decided to stay overnight. The drive home was long, and the hour was late. Ferrell says he slept on a couch in the dressing room. Stirring, he awoke to see a woman slowly walking down the stairs into the room. Ferrell urged himself up. As his slumber-ridden eyes grew to focus, he realized the woman was not a woman, but a small girl. Once she had fully entered the room, he could see only the top of her head poking out from behind the couch. Another incident was recorded on camera and discovered while reviewing footage. A scene is disturbed by a black shadow, which moves distinctly back and forth through the frame six times. In the end, Ferrell decided to keep the mysterious shadow in the movie, deeming it one of the “happy accidents” that often accompany filming. The shadow occurs when Andrew is alone on stage reciting Shakespeare. Ferrell says for artistic creation to be successful, creators must be ready to change their plans when inspiration strikes. In the movie, the ghosts in Everett Theatre are decidedly negative; Ferrell assures me that the true presence in the theater is positive. Most contributors involved in the production of Ghostlight are local to this metro area: Jeff Ferrell, producer, writer and director from Burien; star Brian Sutherland plays Andrew; West Seattle star Lisa Coronado plays Andrew’s wife Mira; Jim Charleston, production supervisor from Burien; Jason Alberts, sound director in Ballard; and Russell Hodgkinson, who plays the caretaker, lives in White Center. Ferrell says he couldn’t have been happier with the final product. Credit, he says, goes to the cast and crew. “It’s very important to have a team of collaborators who all want to contribute to the realization of the same dream,” says Ferrell. Ferrell says he’s been drawn to the dark side of life since childhood. He and his grandmother spent many nights watching classic horror movies together. I was lucky enough to view the movie pre-screening, and I can’t recommend it enough: it is cohesive, horrific, emotional and aptly-directed. The movie runs through tonight at the Tin Theatre in Burien. Then, there is a special Halloween viewing at the theater that both inspired the movie and served as a set: the Everett Theatre. This showing of the film is a fundraiser. Profits go to the Everett Theatre to help it stay on its ancient feet. Thanks to Dina Lydia for the video! She recorded two tribal bellydancers you might recognize from West Seattle’s legendary Troupe Hipnotica, dancing outside Aaron’s Bicycle Repair during last Thursday’s August 2013 edition of RatCity ArtCity. This month’s theme was again live performance/art, and the dancers were a lively example. We are hosting another Live Performance Extravaganza in White Center! We place artists all over the streets of White Center to perform for the public during this 3-hour festival. Any other live performer you can think of! 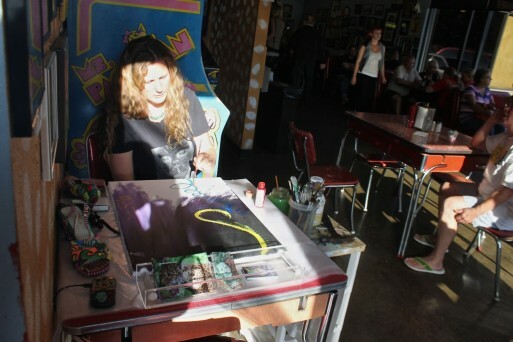 Among the lineup of artists who were painting live during Thursday night’s RatCity ArtCity walk – Shannon Kringen, a local legend if you’ve been in the area for more than a few years. 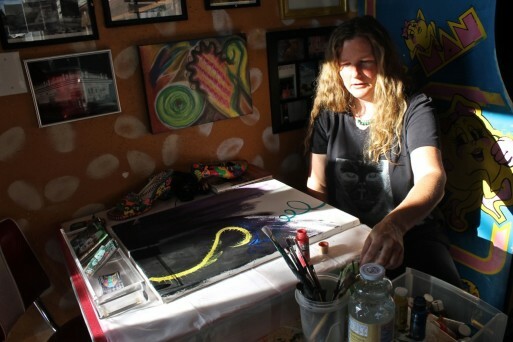 Her long history as an artist includes 15 years as star of her own cable TV show. Now she’s focused on off-screen creation. We stopped by to see her appearing as featured artist at Zippy’s Giant Burgers. Kringen was one of more than half a dozen artists participating in this edition of the monthly art walk.